French food is neither fussy nor expensive. You’ll be pleasantly surprised by these easy French recipes. This time last year I was furiously researching how to take six kids and one husband to France without going broke or AWOL. Last fall we actually made it happen. To say that I miss la belle France is, indeed, and understatement. I can’t tell you how much I want to go back. I’ve told my family that 2016 is our year for a return trip. We just need to save up the money. In the meantime, I’m doing my best to cook like a bonne femme. Last week I read Lessons from Madame Chic ( <– affiliate link) and was inspired anew to put in a little more effort at dinner time. We’ve enjoyed a few more baguettes as well as some great multi-course meals. While it sounds like a lot of work, it’s really proving not to be too much. Plus, bread and cheese? Yes, merci.Today, in honor of le quatorze juillet, I present some of our family’s favorite French-style dishes. Now, July 14th, aka Bastille Day in English-speaking countries, La Fete nationale in France, was a fairly bloody affair. The French Revolution of 1789 (there were many revolutions in France) was very passionate, to say the least. It makes our own war for independence seem a little tame by comparison. Nonetheless, it was a great moment for the common people to take a stand against the tyranny of rulers. I love France. Truly. Quirks and all. I especially love their national cuisine. 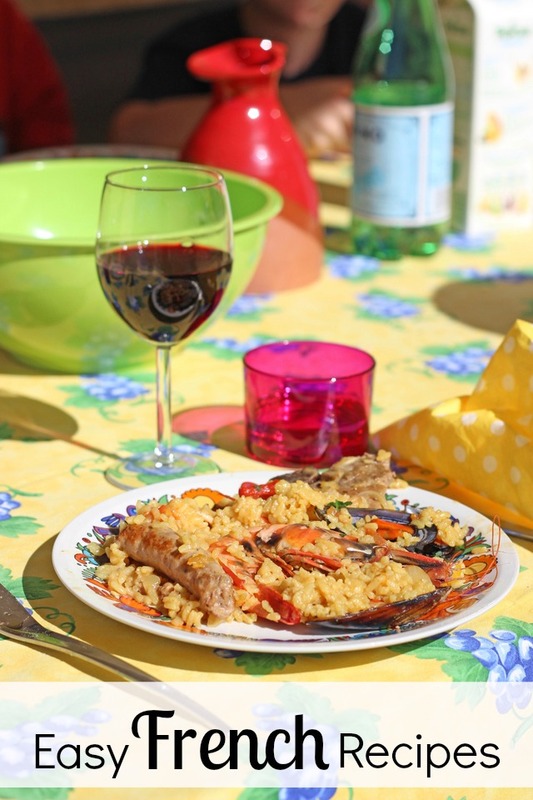 So, let’s enjoy some of these easy French dishes! Note: pictured above is my French family’s delicious Paella. I’m hoping to recreate it this week and share it with you soon. Petit Dejeuner is a wonderfully French way to start the day. Slather fresh baguettes with butter and jam and serve alongside coffee or hot chocolate. If your bakery makes pain au chocolat (chocolate croissants), go for it! 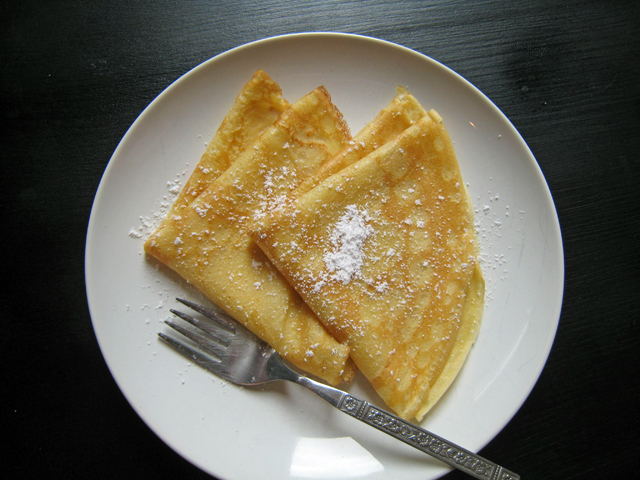 What’s more French than les crepes? You’ll be pleasantly surprised with how easy it is to make these. They are delicious for breakfast, an afternoon snack, and dessert. Make the batter in advance so the flour and liquid form some thingamabobs that Jen told me about and I’ve now forgotten. 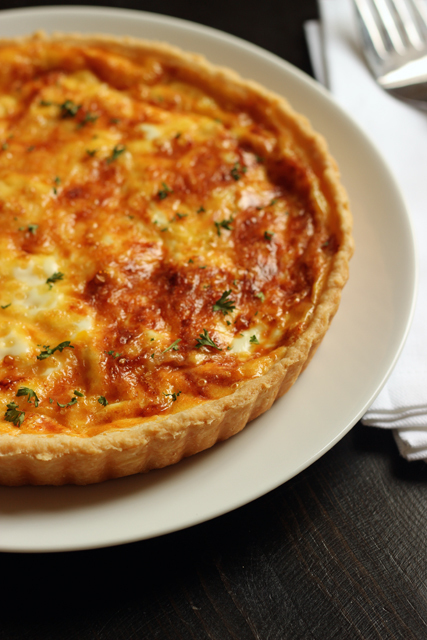 This quiche, rich with ham, Gruyere Cheese, and Leeks will make any breakfast, lunch, or dinner shine. I need to make two of these because my kids gobble it down. 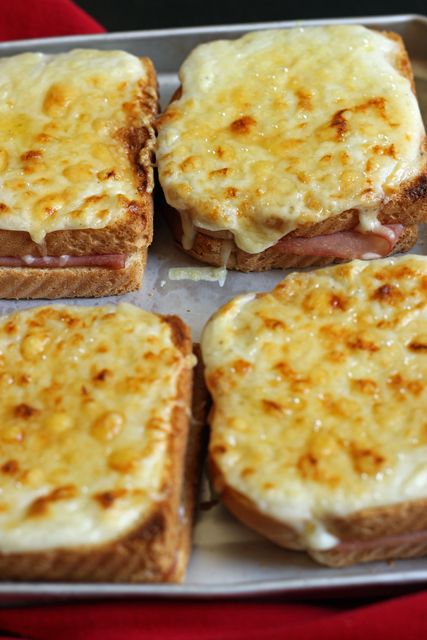 A Croque-Monsieur is the French answer to the grilled cheese sandwich. And it’s pretty darn awesome with Gruyere cheese, ham, and bread topped with a creamy Beschamel sauce. While the French do love their ham — they even put it on pizza! — they do a great roast chicken as well. 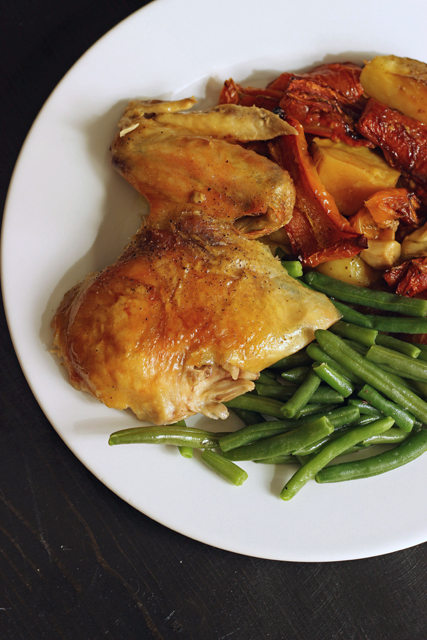 This easy recipe is one that we smelled every day in Paris. It tastes so delicious! Enjoy a taste of the Mediterranean with this easy Escalivada, chock full of eggplant, zucchini, onion, tomato, and peppers, drizzled with olive oil. 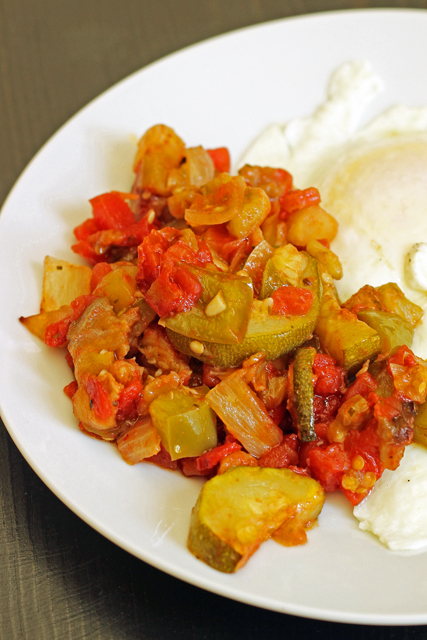 This dish is often served as tapas or as a relish for grilled meats and fish. My French mom Michèle served it with charcuterie, cheese, and bread. It would also be great on pizza or folded into an omelet. 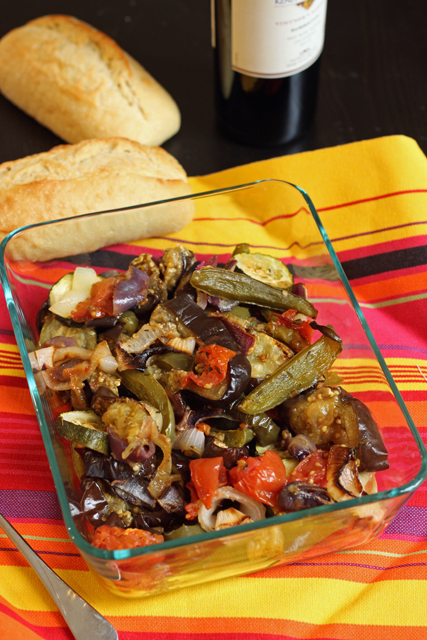 If you’ve got some summer eggplant and squash, use it for this easy oven-roasted ratatouille. I typically make the version in my freezer cookbook (affiliate link), but I really like this hands-free version. Ratatouille is not a pretty dish, but it is delicious! I’ve served it simply over rice, alongside grilled chicken and fish, and also with fried eggs, which is the way my French mom says to do it. 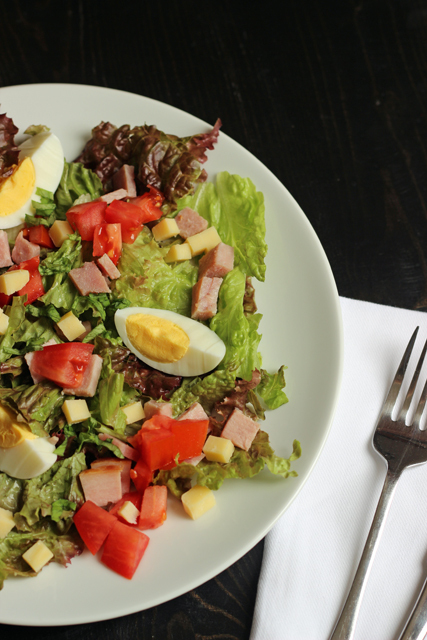 Ham and Gruyere cheese add rich flavor to this hearty salad that evokes tastes of France. 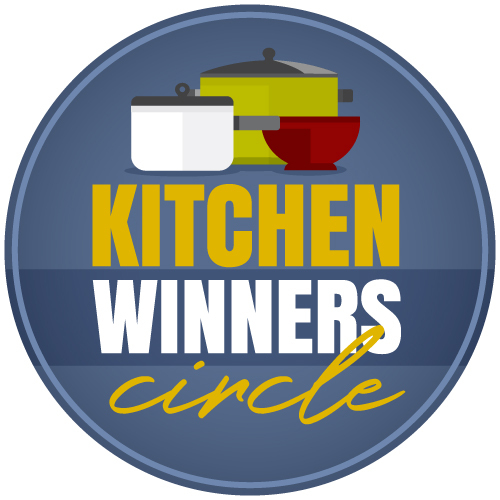 This recipe takes less than 30 minutes to prepare and tastes great! Boules de Picolat is a traditional Catalan dish that I first tasted in France and it became one of my favorites. 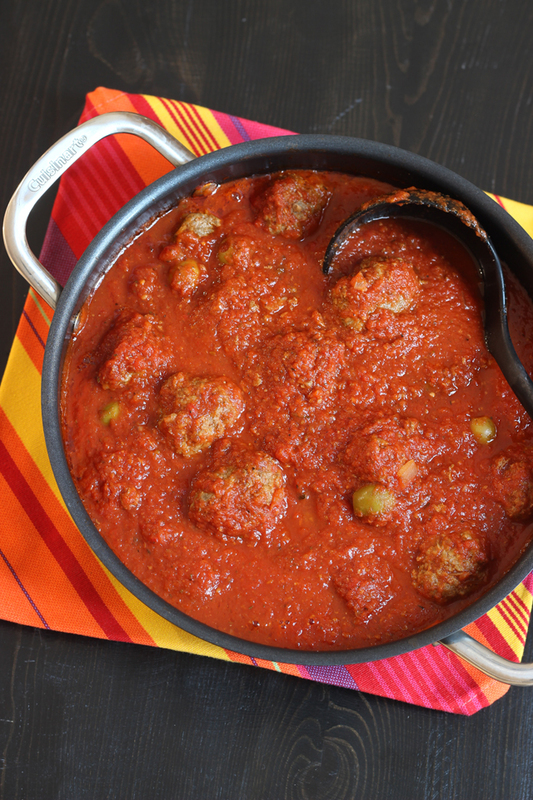 These meatballs, made of a combination of pork, beef, and mushrooms and then simmered in a sauce, can be served over rice or potatoes. The Cheese Course is a traditional end to a French meal. Serve up some baguettes slices with a selection of cheese and fruit. 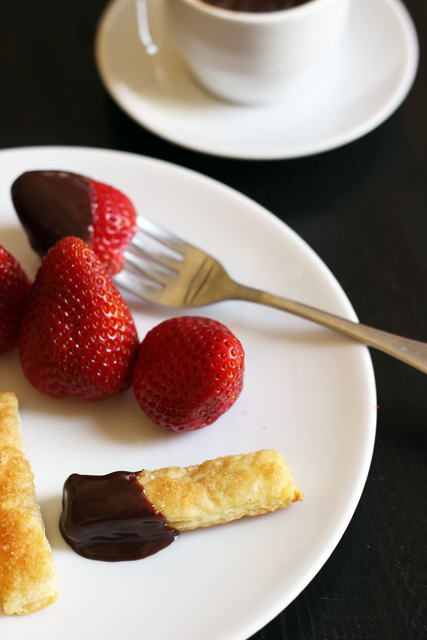 Chocolate Fondue is the perfect way to end a meal. Yum! It’s so quick and easy. Serve it with fresh fruit and Cinnamon Puffs for a simple but delicious dessert. 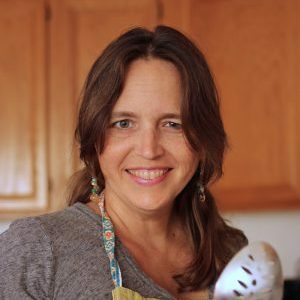 What’s YOUR favorite French recipe? This is perfectly timed! 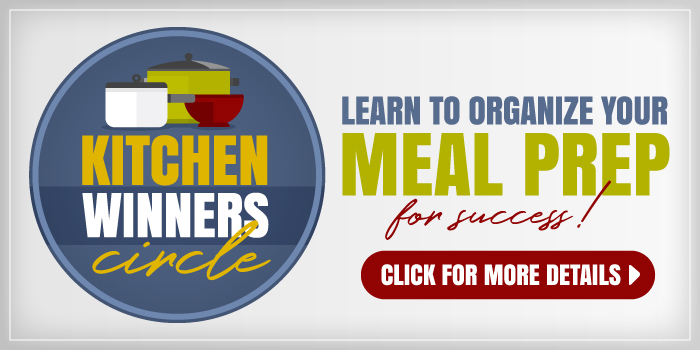 I have been getting the urge to eat more meals in the French style, but I need simple recipes that can fit more easily into my life. This is perfect inspiration! Two years ago my daughter had the opportunity to go to Europe, travelling with an organization called Ohio Ambassadors of Music (I do believe the Ambassadors are in each state, but since we’re from Ohio…) The students were selected from area high school bands, orchestras, and choirs. They performed in all but one of the 7 countries toured over a period of 16 days. My husband and I were able to accompany them as “adult travelers” – meaning we weren’t acting as chaperones – there were teachers for that:) What an incredible experience! We loved it. It was to just give us “a taste” of Europe. The unfortunate part, if you will, is that once you get a taste of something you usually want more, right? and oh my, that “taste” was NOT enough. It’s such an odd feeling longing for something like I long for Europe. Almost as if I belong there and not here. Anyway, one of the things that I absolutely loved was the quiches that were available! Oh my goodness. Yours looks very much like one I had. I remember walking down a street through a farmer’s market in Paris acting as if I belonged there cause I was eating and walking as so many others did. Glad to know they are good memories! One summer when I was in college, I was staying in a hotel in Paris on Bastille Day. I woke up to the sound and vibration of tanks going down the street. It was kind of a military parade. Lessons from Madame Chic was interesting, wasn’t it? Living with the host family would be a little too formal for me. What a great memory! Yes, the book was interesting. Not sure I had the same take-aways, but a dressing gown would definitely solve my issues of answering the door in my pajamas! lol! Surprised no Coq au Vin recipe on here. Nicoise salad is nice, too, from southern France. French onion soup? 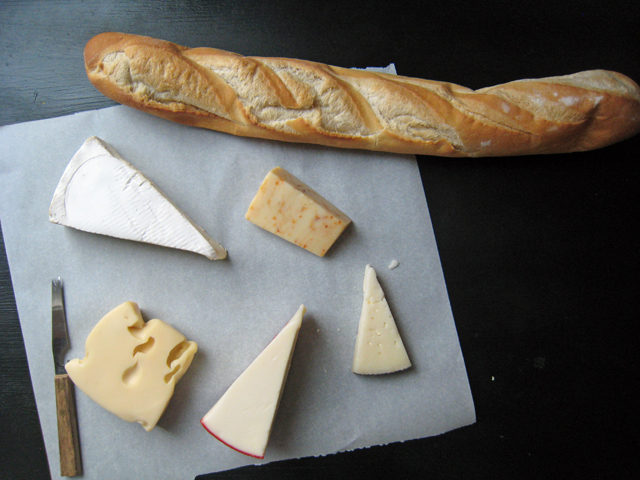 It surely is difficult to beat a nice baguette and cheese, though. Or ham and cheese sandwich made from a baguette and drizzled with a little vinaigrette. To be honest, I can’t remember if they made those with actual baguettes or with the bread that is very similar but a little wider whose name I am forgetting at the moment. Probably the latter, since a true baguette has a pretty small circumference to be trying to make a sandwich. For those who don’t make their own and don’t have a good bakery nearby, I have seen the “chocolate croissants” at Costco that look very similar to a pain au chocolat. I don’t think I’ve ever bought any to see how they taste, but putting that out there for others. Their traditional croissants are pretty tasty.